NOTE: This service is only available for customers who can deliver to and pick up their bottles from our home studio in Houston, Texas. Contact us to fill out a short form to tell us about yourself and the due date for your wine/liquor bottles. We will get back to you ASAP (almost always same day if it’s Monday – Friday) to confirm our availability and get more details about your project. Need an idea for a fabulous personalized gift? 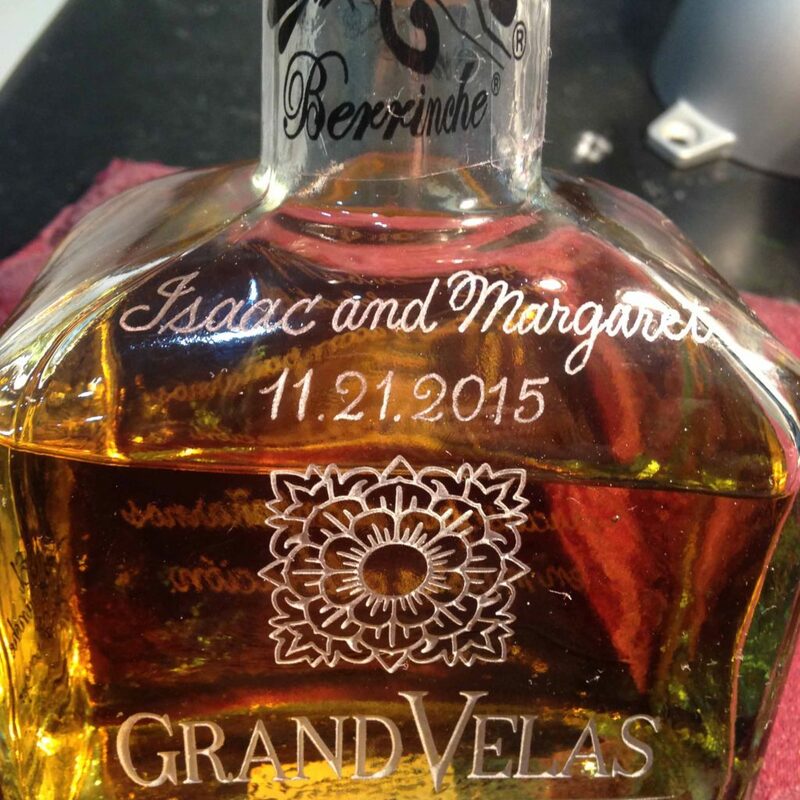 How about beautiful hand engraving on wine and liquor bottles? What better way to say “Cheers!” “Thanks!” “Happy Birthday” or “Congratulations!” than with personalized wine and liquor bottles engraved with names, dates, and short messages. 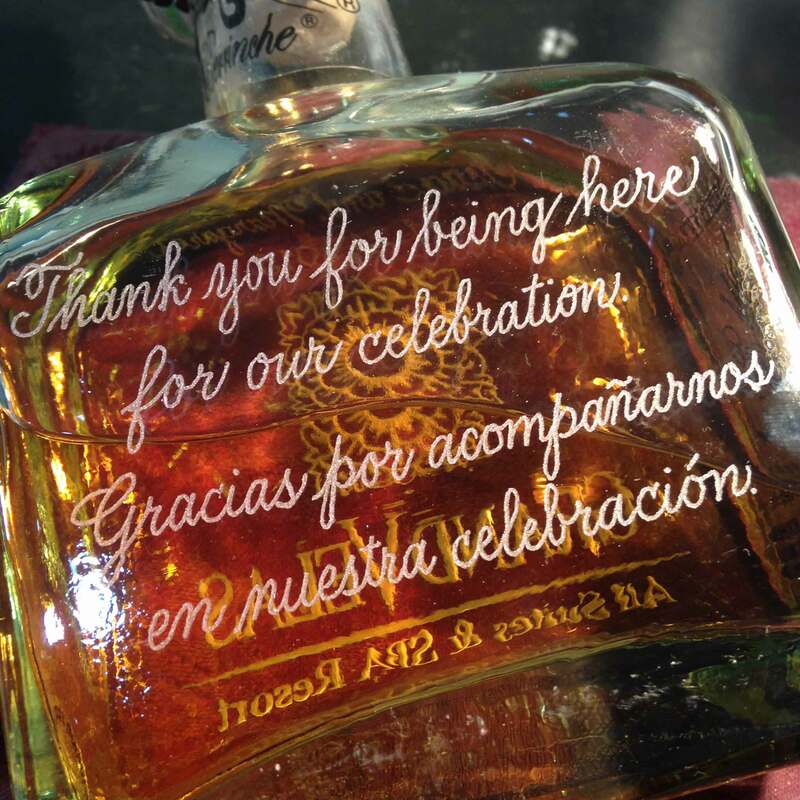 Wine and liquor are always appreciated as gifts, and they look AMAZING when engraved! The happy recipient may even ask you to share the bottle with them! 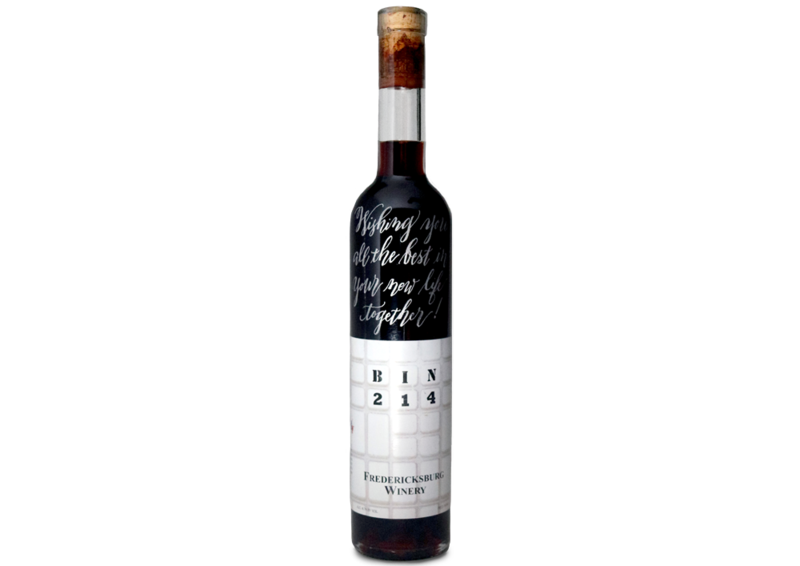 We can engrave above and below the labels (we don’t remove them), up the sides of the bottles, on the back, wherever there’s a smooth surface. And Yes! we can engrave on curved surfaces. No sweat. You can request a quote by filling out our online form. Most orders can be turned around in 5-7 business days. All engraving is done free-hand, not by machine or sandblasting. Engraved messages are filled with either gold or silver paint to complement the bottles’ labels. 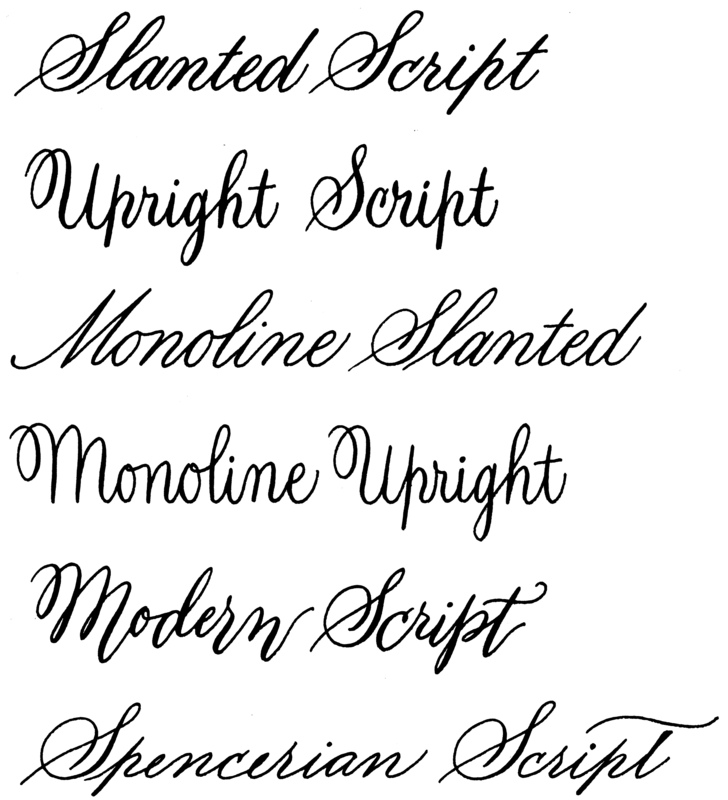 You can request simple (copyright-free) line drawings to be engraved, but not logos or complicated artwork. For logos we recommend that you contact a local trophy shop. I prefer NOT to engrave sparkling wines due to their explosive nature…ask me how I know this! 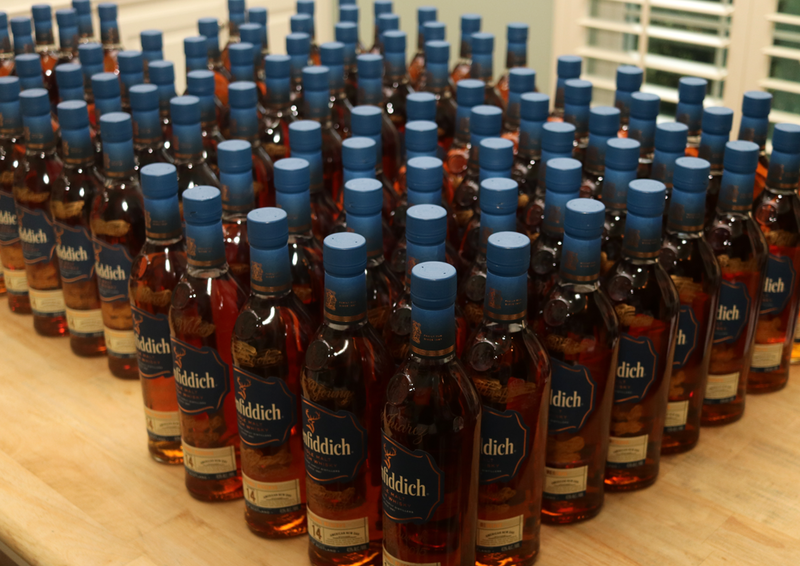 Fortunately the bottles that went kablooey waited until a few hours after I had engraved them – yeah, it was a mess. If you insist on having a bottle of champagne engraved, it will be at your own risk since you have been warned! PenDance will not replace sparkling wines in the event that the bottles shatter after engraving. Engraved champagne should be stored safely in your car’s trunk when being transported, just in case. Most engraving jobs of 12 bottles or less can be turned around in 5 business days. 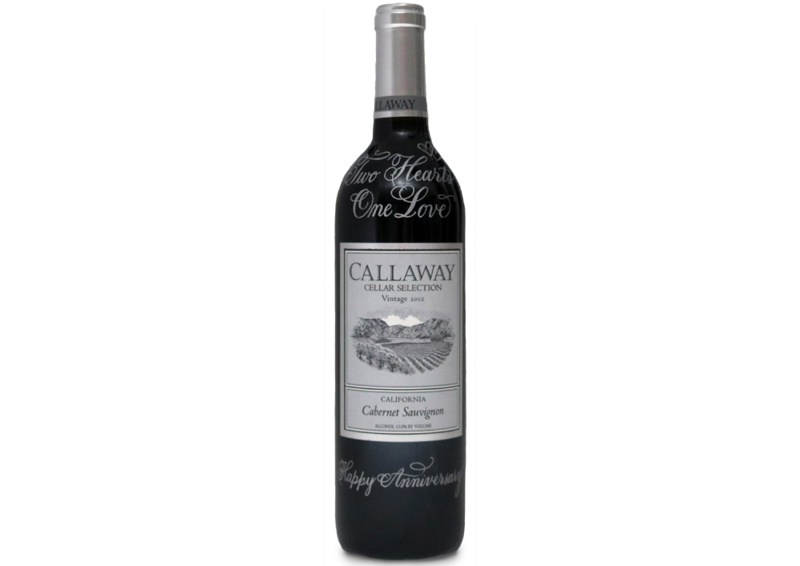 See our sample messages article in our blog for ideas on how to personalize your wine bottles for holidays, weddings, birthdays, anniversaries, and more! Please contact us to tell us how many bottles you need engraved and the message(s) you want engraved on each bottle. We’ll respond by the next business day to let you know if we are available and what the price will be. Our minimum fee for any order is $45 plus tax. After we confirm our availability to engrave your bottle(s), we’ll set up an appointment for you to drop off your bottles. You can also have them couriered to our home studio. Please bring a copy of the text you want engraved when you drop off your bottles. If you need to change the text to be engraved, we may need to revise the quote. We’ll email you when your order is ready for pick up! Payment is due when the order is picked up. If someone else is picking up your order, make sure they have payment available or that you have called us beforehand with your credit card information. Our policy is that no orders are released until payment is received. Maureen, I just wanted to thank you for your beautiful work on the wine bottles for my bosses. They were very pleased with the gift, and couldn’t get over your beautiful work. Thanks again for making our gifts special. Dear Maureen, I received the Fruit of the Spirit stones yesterday. You did a beautiful job! … What a gift God has given you! Thank you for making our Bible study even more special. Love in Him. I just wanted to say how much I love the engraving you did on my sleigh bell ornament. It looks beautiful and I can’t wait to give it to my great nephew and his parents.